Nov. 29 is #GivingTuesday, a global day of giving that harnesses the collective power of individuals, communities and organizations to encourage philanthropy and to celebrate generosity worldwide. 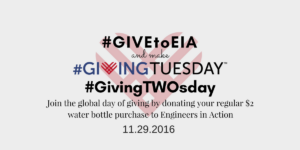 We invite you to recognize this day of giving by donating your regular $2 water bottle purchase to Engineers in Action’s #GivingTWOsday campaign. 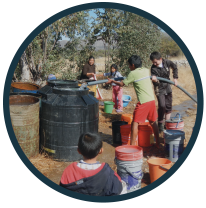 Your donation will allow EIA to continue its integral work dedicated to improving the lives of people in need by providing sustained leadership, training and infrastructure to impoverished communities in Latin America. 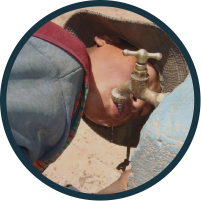 Many individuals the communities we work in lack access to clean, sanitary water and in turn are at risk for waterborne illnesses and sometimes even death. Consider how many water bottles you’ve purchased in the last week, month or year and make a donation to EIA now: bit.ly/EIAGT16. To read EIA’s recent announcement about the campaign, click here to visit our newsroom.